broader public health, clinical, research and educational issues related to CFS. The twentieth meeting of CFSAC Committee was held in Washington, DC, over two days in May. Minutes for the proceedings on Day One (May 10) are now published on the CFSAC website. I will update this post when Minutes for Day Two (May 11) and the Recommendations resulting out of this meeting are also published. Discussion of concerns around the long-standing proposals for the coding of Chronic Fatigue Syndrome in the forthcoming US specific “Clinical Modification” of ICD-10, known as “ICD-10-CM”, had been tabled on the agenda at 1.15pm on Day One of the meeting. ICD-10-CM has been under development for many years. A public comment period ran from December 1997 through February 1998. In 2001, the CDC were recommending that Postviral fatigue syndrome, Benign myalgic encephalomyelitis and Chronic Fatigue Syndrome should all be classified within Chapter 6 Diseases of the nervous system at G93.3, in line with the international ICD-10, from which ICD-10-CM was being adapted for US use. By 2007, the proposal was (and still stands) that Postviral fatigue syndrome and Benign myalgic encephalomyelitis would be classified in Chapter 6 at G93.3, but that Chronic Fatigue Syndrome would be retained in the R codes (which will be Chapter 18 in ICD-10-CM) and coded under R53 Malaise and fatigue > R53.82 Chronic fatigue, unspecified” > chronic fatigue syndrome NOS, Excludes1: postviral fatigue syndrome (G93.3). At the May 10 CFSAC meeting, around 50 minutes was given over to discussion of this agenda item which resulted in a motion proposing a new Recommendation to HHS that was unanimously voted in favour of by the committee. As I have a particular interest in this issue, I have interspersed this section of the Minutes with notes addressing a number of errors and misunderstandings. My comments are inserted in blue, bold. As these notes are inserted into official Minutes I give no permission to re-publish as both the formatting and the integrity of an official document will be lost – so permission to link to this post only. The Chronic Fatigue Syndrome Advisory Committee recessed for lunch for one hour. Brought the meeting to order. Noted they would have a discussion of the ICD-related questions and the proposed reclassification of chronic fatigue syndrome. Chronic fatigue syndrome is not being “reclassified” as such for ICD-10-CM, but being proposed to be retained in the R codes, as a legacy of ICD-9-CM, rather than follow international ICD-10. Advised there was a page in the members’ notebooks tabbed after the State of the Knowledge summary which noted key steps in the development of the ICD 10 CM, so a clinical modification of the World Health Organization’s (WHO) ICD 10. It would replace ICD 9.
o Disconnect between the way the U.S. uses the classification and the rest of the world. o The way CFS is classified under the ICD system has implications for both reporting of incidents, morbidity and mortality. o Used by outside agencies to categorize the illness for purposes of inclusion or exclusion. Opened the floor for discussion. Clarified that the committee requested that the National Center for Health Statistics have someone to talk to them about the international classification of diseases, about the process, about how the U.S. adapts the WHO index, the ICD for use and about opportunities for dialogue. Noted that a meeting was set a year ago for May 10 and 11 in Baltimore that engaged resources for the CMS, parts of the federal government focused on health IT and the entire ICD team from the National Center for Health Statistics (NCHS). Noted that as a result no one was available for the CFSAC meeting. In lieu of their attendance, she developed some questions that the NCHS, ICD team responded to. Tried to clarify the questions so they would have a good understanding of the key processes and the key inflection points differentiating the WHO process from the U.S. ICD-CM, the clinical modification process. Raised additional questions regarding how alignment from prior versions is maintained and how ICD coding is used in decision-making. Noted also the relationship between the coding and the diagnostic and statistical manual (DSM). Stated that the information was provided by the NCHS and is meant to generate discussion. Stated that the ICD-CM process is a public process with regularly scheduled public meetings. Noted that there is an opportunity to comment as part of that process and to engage. Confirmed that the NCHS stated that there has been no public presence from the CFS community at the meetings. Noted that this was the process for people interested in CFS coding to become involved. Confirmed that there was a lock procedure that is soon to be executed for the ICD 10 CM. Noted it had been in development for a decade and the United States’ move to electronic records means it has to temporarily lock the codes. The electronic health records software would not be ready if they keep changing them. Noted that information about coding changes would continue to be collected, taken under advisement and the NCHS would continue the process of evaluating. Stated that once it is in public use then that lock will release and there would be an opportunity on a periodic basis for updating. Stated that the committees are developing ICD 10 CM and it intends to retain CFS in R codes (R53.82) and this means that the symptoms, signs, abnormal results of clinical or other investigative procedures are ill-defined conditions. Stated that R-codes means it’s an ill-defined condition regarding which no diagnosis is classifiable elsewhere. Explained that if it cannot be diagnosed elsewhere in ICD 10 it goes into a R-code. 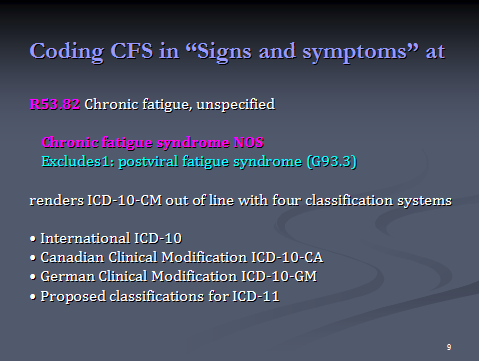 The intention in ICD 11 is to put CFS with two other conditions (post viral fatigue syndrome and benign myalgic encephalomyalitus [sic]) under a G-code, being G93.3 or diseases of the nervous system. For ICD-11, the proposal is to classify all three terms within Chapter 6 Diseases of the nervous system but these categories may not retain the familiar “G93.3” code. For ICD-11, the parent class “G93 Other disorders of brain” is proposed to be removed (this will affect many categories classified under or indexed to a code that is currently a child to the G93 parent class in ICD-10). For ICD-11, categories within Chapter 6 Diseases of the nervous system are being reorganised and different codes have been assigned to Chapter 6 categories to those used in ICD-10. “Chronic fatigue syndrome” is proposed to be an ICD Title code and is currently assigned the code “06L00” in the ICD-11 Alpha Draft, under new parent class “06L Other disorders of the nervous system”. For ICD-11, “Benign myalgic encephalomyelitis” is specified as an Inclusion term to “06L00 Chronic fatigue syndrome”. A change of hierarchy is recorded in the iCAT Alpha drafting platform for “Postviral fatigue syndrome” and “Chronic fatigue syndrome”. Noted that coding CFS under the R-code in the proposed ICD 10 CM would place it out of line with the International ICD 10 used in over 100 countries. Discussed the problems and implications of the U.S. coding of CFS as compared with how other countries are coding it. It would exclude it from the R53 malaise and fatigue codes, which would imply that CFS does not have a viral etiology. That last sentence does not make sense. Retaining CFS under the R codes would exclude it from the Chapter 6, G93.3 classification. Proposals for ICD-10-CM have “chronic fatigue syndrome NOS (R53.82)” specified as an Exclusion to “G93.3 Postviral fatigue syndrome > Benign myalgic encephalomyelitis”. Proposals for ICD-10-CM have “Postviral fatigue syndrome (G93.3)” specified as an Exclusion to the “R53 Malaise and fatigue > R53.82 Chronic fatigue, unspecified” > Chronic fatigue syndrome NOS codes. CFSAC rejects current proposals to code CFS in Chapter 18 of ICD 10 CM under R53.82 chronic fatigue syndrome unspecified, chronic fatigue syndrome NOS (not otherwise specified). CFSAC continues to recommend that CFS should be classified in the ICD 10 CM in Chapter 6 under diseases of the nervous system at G93.3 in line with international ICD 10 in ICD 10 CA which is the Canadian clinical modification and in accordance with the committee’s recommendation which we made in August of 2005. CFSAC considers CFS to be a multi-system disease and rejects any proposals to classify CFS as a psychiatric condition in U.S. disease classification systems. May 2010 CFSAC recommendation: CFSAC rejects proposals to classify CFS as a psychiatric condition in U.S. disease classification systems. CFS is a multi-system disease and should be retained in its current classification structure, which is within the “Signs and Symptoms” chapter of the International Classification of Diseases 9-Clinical Modification (ICD 9-CM). August 2005 CFSAC recommendation: Recommendation 10: We would encourage the classification of CFS as a “Nervous System Disease,” as worded in the ICD-10 G93.3. Noted that ME and CFS patients could be potentially vulnerable to the current DSM 5 proposals because those proposals are highly subjective and difficult to quantify. Noted that retaining the CFS in the R-codes in the IDC 10 CM differentiates the U.S. from other countries but it renders CFS and ME patients more vulnerable to some of the DSM 5 proposals, notably chronic complex symptom disorder [sic]. Should be “Complex Somatic Symptom Disorder”, not as above. Dr. Klimas asked for clarification, and Dr. Jason said that in 2013 they would move from DSM 4 to DSM 5. As it stands they would be collapsing somatization disorder, undifferentiated somatoform disorder, hypochondriasis and some presentations of panic disorder into complex somatic symptom disorder. Dr. Klimas clarified that his concern was that the CFS ICD 9 codes would put the non post viral patients into this somatoform cluster. Dr. Jason indicated that this was so. Should be “pain disorder” not “panic disorder”. Dr. Klimas seconded the motion. Mr. Krafchick agreed and stated that the ramifications of the classification would be disastrous for patients, because it would limit disability payments to two years. Dr. Jones clarified that for now the clock was ticking, however once the codes were released, they could be revised, it’s just the implementation of the electronic system which is causing it to be locked at a particular point in time. While CFSAC has shared concerns with NCHS, there is an official process for engaging with them on their discussions regarding the codes. The US was interested in morbidity, in case claims. It is important that providers know how to best categorize things, and provide guidance on which codes to consider based on the science for the disease being evaluated. Mr. Krafchick stated that the issue was that the criteria for the codes was etiology/trigger based. Dr. Jones clarified that it would still remain in the clinician’s judgment, however if they could not identify where the trajectory developed toward CFS, then it would wind up in the R codes. Dr. Jones clarified also that the NCHS does not view the R category as a somatoform disorder. Mr. Krafchick and Dr. Snell indicated they understood this but it would still represent vulnerability for patients when classifying. Dr. Jason restated his recommendation. Dr. Marshall stated his concern that there was an attendant risk with this, but that they were between a rock and a hard place. He agreed CFS/ME being classified as a somatoform disorder was inappropriate, but at the same time that the recommendation says it’s a complex multi-system disease, it categorizes it within a single nervous system disease silo. This might affect future research funding opportunities with people saying they don’t fund neurological research. He expressed the view that they should advocate for classification in a multi-system disease category rather than putting it in a nervous system disease category for future, though this category did not exist now. It would be a good thing for patients short term, but it could be a long term risk. Dr. Snell said that given the amount of current funding, this wasn’t a risk. Dr. Marshall said that using reverse translational research as had been advocated during the meeting might increase the role of this categorization, and could be restrictive in funding. Dr. Jones asked whether the recommendation being put forward was the same as the May 2010 recommendation, and Dr. Jason said that his was dramatically different. Mr. Krafchick underscored how the insurance companies use these ICD codes. If it was classified in something that could be psychiatric it will be psychiatric, so they can deny coverage. Dr. Levine asked about co-morbid disorders and how these are weighted. Dr. Jones responded that she did not think that there was a weighting. It would get listed like a death certificate, a cause of death and then a secondary, sometimes a third. She stated it was the judgment of the clinician how it was listed. Dr. Klimas expressed the view that coding was also problematic because clinicians code to get paid. There already exists a bias against coding CFS as CFS because the codes could not be used for billing. She stated that they would make a conscious decision not to code CFS as CFS. She indicated that neurology was a fine place for it to be categorized, and at least this would assist people who may be looking for patient data, as it wouldn’t be ignored. Dr. Snell asked for a vote of all those in favor regarding Dr. Jason’s motion. The motion passed unanimously. Dr. Jones noted that she would share this recommendation with the NCHS but repeated that unless someone moved forward to intervene in the official processes in the public record it may not move forward or have an effect. Dr. Jones noted that the next ICD meeting is September 14 – 15, 2011 with public comments due July 15. Noted this will be put on the CFSAC website. She noted she would check the rules to see if a member of the CFSAC or the Chair would be able to give public testimony at another advisory committee meeting. Mr. Krafchick said that if it were possible to send someone as a member of the committee, it would make a great deal of sense and be very important. Dr. Jones said they would figure out how this could happen. Ms. Holderman asked whether this notice, and any future notices where they might want to intervene, could be placed on the CDC website. She stated this cross listing would be useful. Dr. Jones said that from her experience with the fast evolving HIV coding, there was a dialogue so that coding kept up. She expected there would be some connection, however not as comprehensive or active as that disease. Dr. Mary Schweitzer, a member of the public, stated that the NCHS did come to CFSAC in 2005 and Dr. Reeves at the time was specific and said that CFS needed to be in R53 due to his own method of diagnosis. She suggested that this showed an obvious connection between the CFS side of CDC and NCHS at the time.